What They Took With Them As They Fled Conflicts As people escape from turmoil around the world, they often can carry only a few items with them. In hindsight these objects are often precious reminders of the lives they left behind. 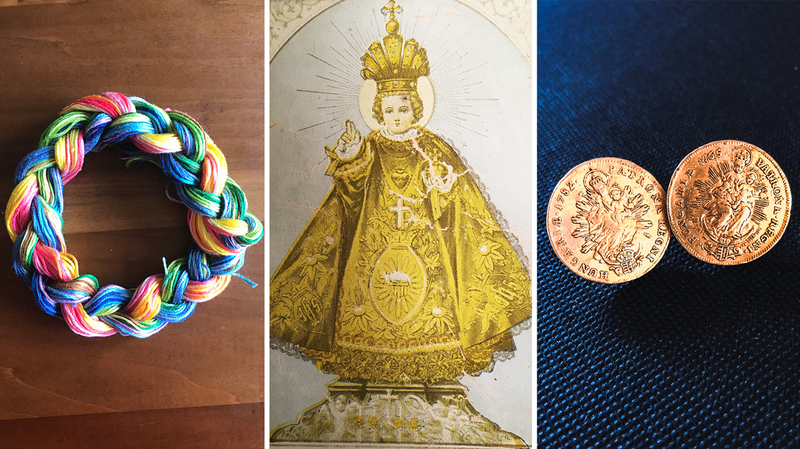 Embroidery thread, a picture of the baby Jesus and gold coins are some of the objects people took with them as they fled their homes. As people escape from turmoil around the world, they often can carry only a few things with them. Settled in their new countries, as years and sometimes decades go by, they often find these objects precious reminders of the lives left behind. They're cherished long after the crisis has passed. In some cases, these keepsakes remind refugees and migrants of an essential part of who they are. NPR's story about how a toy monkey ended up becoming a connection to a previously unknown part of a German boy's family inspired us to look for other similar stories. Below are a few such stories shared by NPR listeners and readers. Though in their own words, the text has been edited for clarity. Loan Pham was born in a small village in southern Vietnam in 1984, nine years after the end of the Vietnam War. 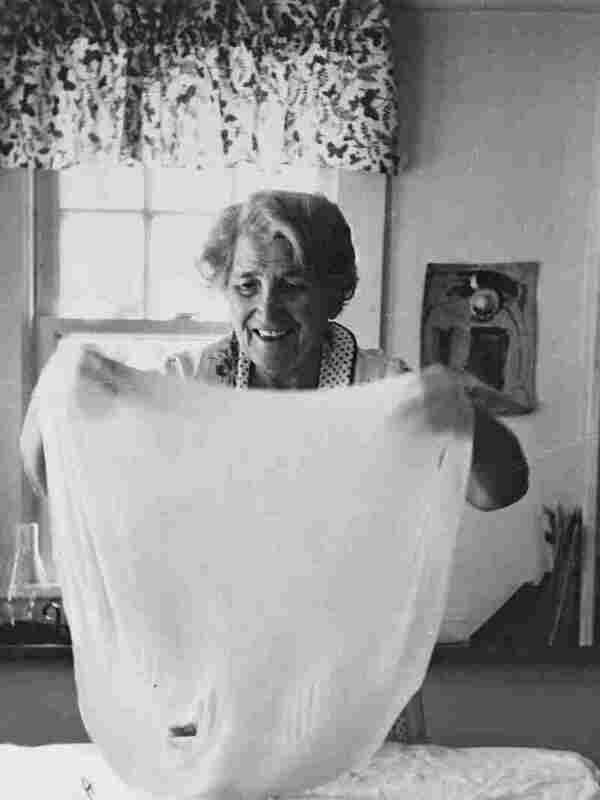 Her immediate family supported the South Vietnamese regime. When the communist North Vietnamese prevailed, they were ostracized, she says, even by members of her extended family. They wound up homeless. 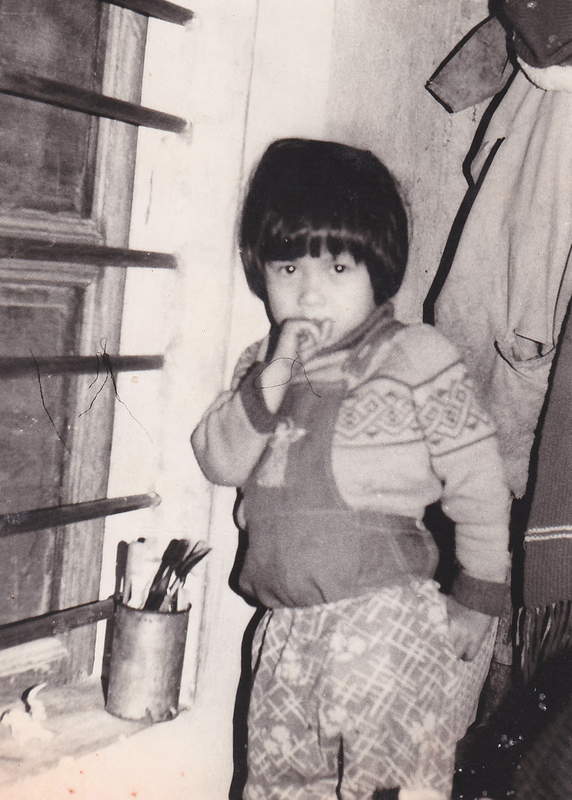 Loan Pham often went hungry as a child, so she became a food thief in Vietnam. When her family left the country, her father gave her a red backpack to take to Thailand and on to the United States. The backpack was filled with rice. We just took shelter at the schoolyard in the village. Villagers who would feel sorry for us, not our relatives, they would donate empty rice bags, so we could tie them up as a small canopy for a family of four to shelter ourselves from the rain and the monsoons. I'm kind of ashamed to admit this, but I became a professional thief. A food thief. I really couldn't tolerate hunger. I kept on going to this village market and stealing bananas. I really couldn't tolerate the pain from hunger. My mom was very ashamed and she beat me up quite often for this heinous act. One time, Pham said, a local food vendor caught her stealing bananas. She was obviously unhappy. So she threatened to burn me up. She tied me to a pole. She put hay all around me. She lit the hay on fire. I had no idea what was going on and thought there's no way this woman is going to burn me for a banana. And the woman started freaking out because the fire got closer and closer to me. I was right in the middle. And then a man walked by, saw what was going on. He ran to me and got me. And that's what saved me that one day. The brutality of war and then postwar starvation really forced people to lose their humanity, competing against each other for food, basic, basic necessities. Pham and her family were granted asylum in 1991 to come to the United States. When my family left Vietnam, my dad gave me a red backpack to take with me to Thailand and to continue on to the United States. And in that backpack was all rice. Rice can be really, really heavy on the shoulders of a tiny 7-year-old kid. I felt so important. I felt so empowered. Rice was so precious. Never, ever in my life had I seen that much rice, so I guarded it with my life. I would not let it leave my sight. And we ate that rice when we came to the United States. We didn't have money. That rice lasted us for the first week or so. The backpack, I carried to school the very next day after I arrived. I felt really proud. I felt really foreign, actually. Because I'd never owned a backpack. In fact, I'd never seen a backpack. I know this sounds really extreme but we were like cave people back in this Hue village. Things like pens and pencils were so amazingly expensive. Pham no longer has the red backpack. But she did take to school and education. 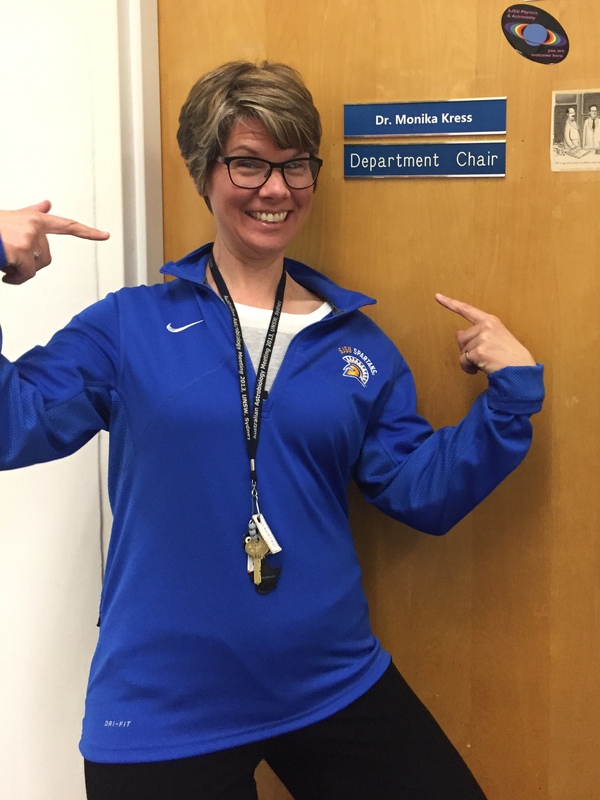 She is working on her Ph.D. in military history from the University of California, Berkeley. My name is Delia Raab-Snyder and I'm from Philadelphia. My great-great-grandmother was Bossie Cohen and she came from Odessa, Ukraine, to Philadelphia in 1905. They were Jewish — her husband was a rabbi — and anti-Semitism was on the rise. She brought her samovar with her because it was probably one of her most expensive items that she owned. It's a giant metal pot and then underneath that it has a chamber that you put a piece of coal in and then you light the coal and it heats up the water. And they drank a ton of tea. She brought her infant son, who later died. They had eight more children and they lived in a tenement here in Philadelphia. My great-grandmother was alive until I was about 14, so I heard a lot of stories about the samovar. Raab-Snyder's great-great-grandmother came to Philadelphia from Odessa, Ukraine, in the early 1900s. She brought her samovar because it was probably one of the most expensive items she owned. 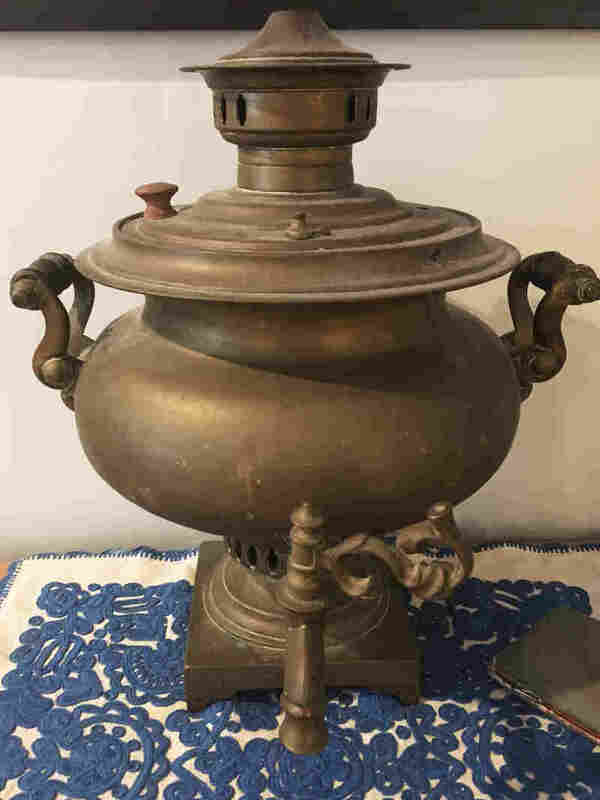 It was a source of warmth in the house and my great-grandmother told me her brothers would go out to the train yards and find pieces of coal that had fallen off trains so they could keep the samovar going. The family legend is that they always had one sugar cube hanging from the ceiling on a string, and then each person in the family would get to lick the sugar cube as they were drinking their tea because they couldn't afford to have more sugar in the house. My great-grandmother turned the samovar into a lamp in the 1950s. And when she died, I inherited the samovar. I now have a daughter and we live in a really small house, which is actually only nine blocks from the port where my great-great-grandmother came with the samovar in the first place. [I'm 36 and] I think a lot about the really deep sort of connection to the old country that I grew up around with my great-grandparents. I think if you would ask my great-grandparents if they were white they would have said no — that's really changed in my mother's and my generation. I know my daughter won't experience Jews in America like that. So to have this object that's a connection to that time is really important to me — and to know that I had this matriarch in my family who lugged this thing across the ocean with a newborn. Helen Lom escaped with her parents from communist Czechoslovakia to West Berlin, a few years after World War II ended. She was 4 years old. 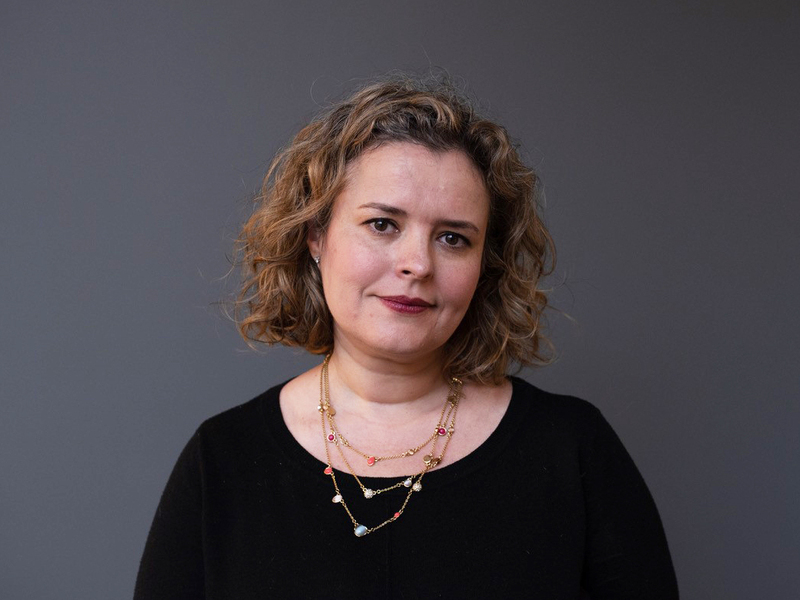 Her daughter Katia Lom, a 33-year-old filmmaker based in London, described one thing they took with them that still holds a special meaning in the family nearly seven decades later. 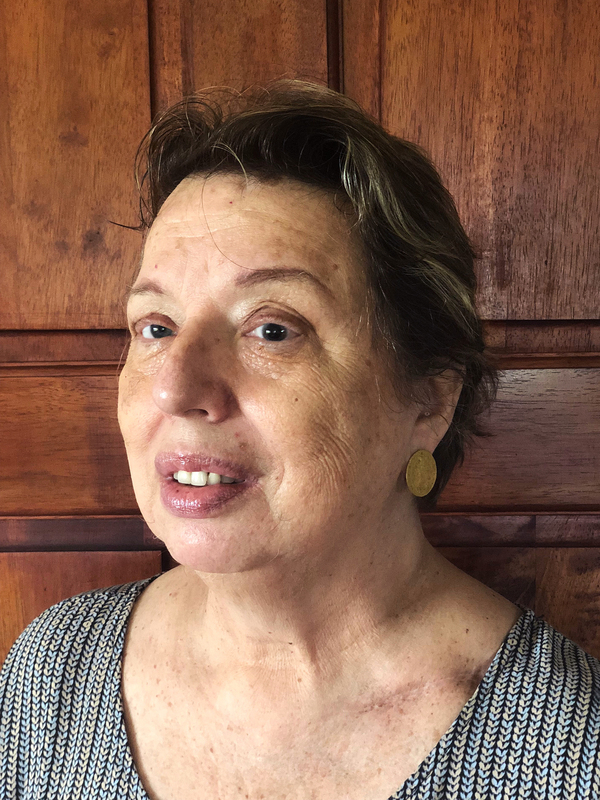 What [my mother] could remember were the sounds and the experience of having to escape through the woods of night, of being chased by armed guards, being chased by dogs and having to stay really quiet with her parents. 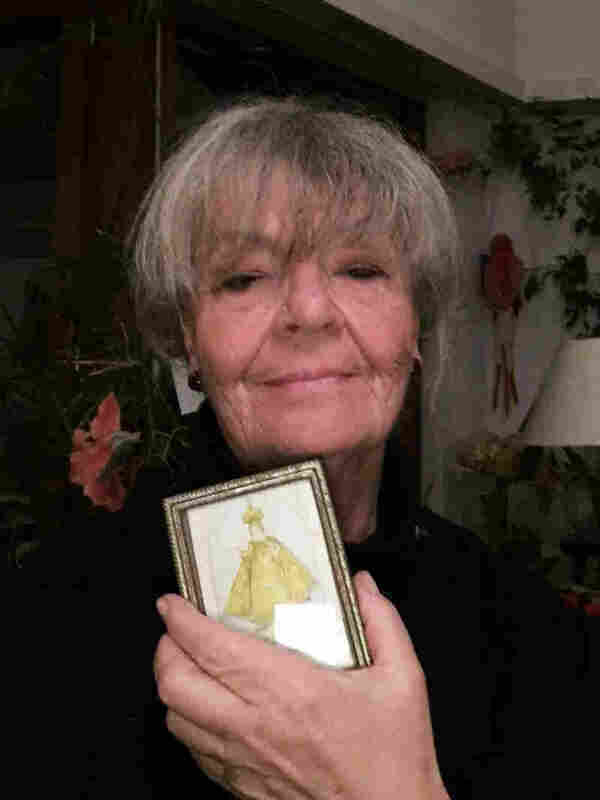 Helen Lom holds an image of the baby Jesus that she took with her when she fled communist Czechoslovakia with her family. They couldn't tell her that they were leaving. So for my mother, that was very distressing. What was important to her at the age of 4 were all her toys. She couldn't bring anything with her. If anyone were to find out that they were planning this escape, they could have all been killed or sent off to prison. You can't really bring personal things with you when you're escaping. And with my family the one thing they did bring with them was a small print of baby Jesus of Prague and we still have the print. It's not much larger than a postcard. And it was always in this little very unassuming frame and it was always hanging in [her parents'] kitchen. It was not in a fancy place of the house, but it was in the place where they would see it every day. And we were always taught that this was the lucky object and that it helped the family. Even if I went back today to Prague I'm not Czech really. Even though I am legally, I don't know how to speak the language, I don't really know what Czech people are like today. So this object for us, it feels like that's home. So it feels like that's our history, that's us. My grandmother would always say that "baby Jesus has come with us everywhere we have gone." My name is Sidiqa Sidiqi. I was born in Afghanistan, in the city of Kabul. Sidiqa Sidiqi was born in Afghanistan and left after the Taliban closed the schools in Kabul. Sidiqi was in an elementary school when the Taliban seized control of Kabul in 1996. So I didn't go to school for almost six years. Even after the Taliban fled Afghanistan in 2002, she says the country was still unstable. Her parents decided to get out. It was winter 2005 we started packing. We didn't have a lot of space, so we couldn't take everything with us. I remember packing and choosing what items I wanted to take with me. My schoolbooks were one of them. They're normal first-grade books: the alphabet, numbers, pictures, things like that. She moved to the United States. The things that I brought with me — my books, my toys — those are things that I don't use anymore, but they remind me of who I was. I had them on my bookshelf for the longest time. Then I got married. When I went back to Afghanistan in 2012, I went back to my old school and I met my teachers. But I couldn't find my friends, classmates. Because of the war, most of them either left or were killed. 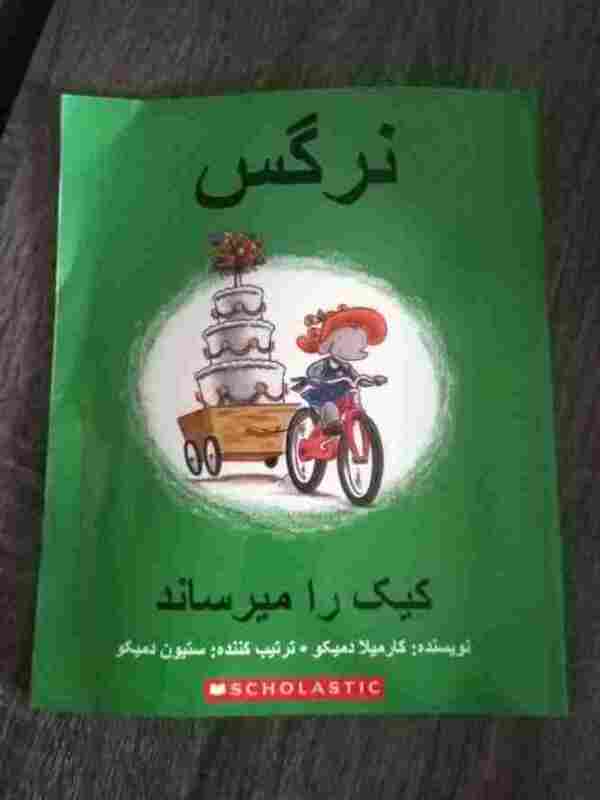 I have a 4-month-old baby and when she grows up I will probably have her use those books to start learning her Farsi. For some people like us who are deprived of their right to study and go to school, schoolbooks meant a lot. Sarah Daily Frey moved to the Dominican Republic when she was a child. Juan Antonio was her first boyfriend and gave her a gold ring. Over the years they lost touch but in 2014 they reconnected online. Sarah Daily Frey was born in Cuba, where her parents were missionaries. When she was 7 years old, they moved to the Dominican Republic, where they lived until she was 14. When the dictator of the Dominican Republic was assassinated in May of 1961, it kind of threw the country into turmoil. I had just started my freshman year in high school. I had gotten caught up in a couple of those skirmishes on the street. And it scared me. That's what prompted my folks to say it's time to get out. And so their decision was suddenly for me to live with a family in Minnesota. But [there was] one thing that I did have — that kept me knowing that I was loved and that I had friends, I had a place to be. It was a beautiful gold ring with a Brazilian aquamarine in the middle round and then it had two little rubies on each side and I just loved the ring. My first boyfriend [was named] Juan Antonio. He very shyly gave me this box and he said I want you to remember that this is our love. I ended up in Minneapolis, 30 degrees below zero. I was miserable and that ring became my comfort. Juan Antonio and I wrote each other all the time, and then the letters just became a little bit more sporadic. When my mom was evacuated by the American Marines, she told me Juan Antonio was married, and that was quite a shock to me. 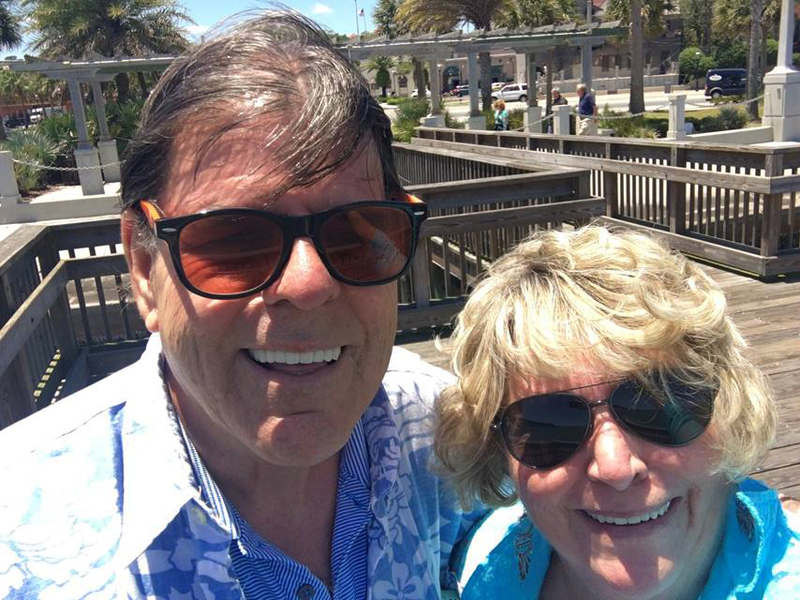 I got married in 1968 to Gordon [Frey]. I had three daughters, and the oldest daughter asked me if she could borrow two rings to wear to school. Well, she had a swimming class and she had taken the rings off for her swimming class. And when she came back to her locker they were gone. I had worn that ring on my finger for 25 years. We were both devastated. I had tried several times to try to find [Juan Antonio] online. That's when the Internet was just coming up, so I kept trying. And finally one day I thought, well, I'm going to try one more time. And there he was and I wrote and I said, "Did you know somebody named Sarah Daily?" And he wrote back and me said, "Yes, absolutely." We were catching up with each other and he said, "So, do you remember that ring that I gave you?" And I said, "Well, of course I do." I said I'm sorry to say that I don't have it anymore. And he said, "Well, you know that's just part of life." My husband was diagnosed with brain cancer. He died in September of 2014. Juan Antonio just became rock solid in my life. Two years ago I went down to meet him. Just spent our time talking and talking and talking and laughing it was like no time had passed at all. Friendship was the thing we needed from each other. That ring is gone, but the circle of the friendship and the care and the love is just never ending. 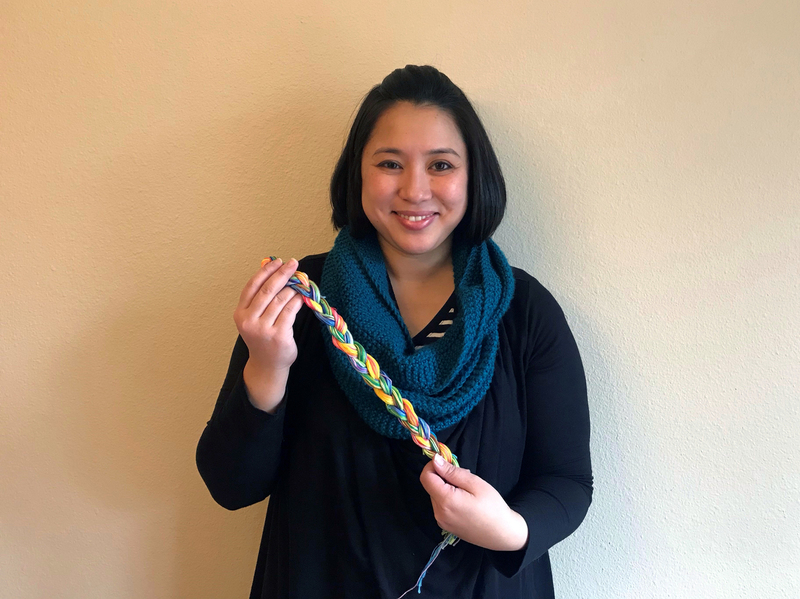 Ahn Quach Crandall holds embroidery thread that her mother bought in Vietnam before her family came to the U.S. in the 1970s. My name is Anh Quach Crandall. My parents are from Vietnam. In 1975, during the fall of Saigon, at the very end of the war, they were scared of what would ensue once the North Vietnamese army marched into Saigon. So my mom's cousin's husband, who was a commodore in the South Vietnamese navy, got them onto a boat, and they left. In addition to clothes, family snapshots and some food, my mother brought embroidery thread. It isn't the spools of thread you think of, but the six-strand floss that those of us who grew up in the '80s would use to make friendship bracelets. My mom was pregnant with my sister at the time, and sewing had always been a hobby for her and she [planned] to embroider clothes for my sister. In Vietnam it was very expensive. She thought wherever she ended up that it would be expensive, but [in the U.S. in the 1970s] you could go to a craft store and get [it] for under a quarter. So, they got to America [Manchester, N.H.]. And, you know life happens, and she had to get a job and go to school, and she had a newborn baby, so she didn't have time to embroider. But she did sew a lot and that was when she would tell stories to my sister and me and my brother, stories about her family and our family and how we came to America and the struggles. It was a way for me to connect with her. Then I started getting into sewing. I started cross-stitching and she noticed that I enjoyed that as a hobby, and so she pulled the thread out of the closet, and she gave it to me. [But] I haven't done anything with it, because there's a finite amount of each color in this thread. It's been in a craft box, you know, amongst beads and googly eyes for years. "This feather may look worthless, but it comes from afar and carries with it all my good intentions." And I think that feels fitting to me. 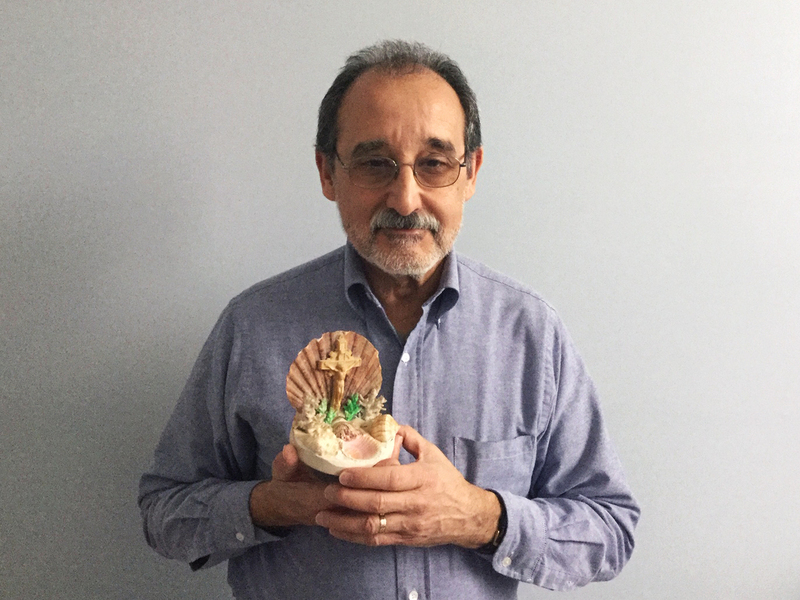 Jose Linares keeps the crucifix in his office, near the computer. As part of Operation Pedro Pan, Jose Linares and his brother, Raul, were among 14,000 children airlifted out of Cuba for the U.S., unaccompanied by their parents, following the Cuban revolution. My name is Jose Linares — Jose. I'm 68. I was born in Cuba. I came to the States in 1961. My parents stayed behind. My parents were very much afraid of the Castro regime and the communism that came with it. Indoctrination of children had already started and they didn't want any of that. When Jose left for America, his mother gave him a Zorro mask to take with him on his journey. The mask was stolen out of his duffel bag when he got to the U.S. I remember my mom had given me this mask, this little Zorro mask that was gone. In 1962, Linares and his brother were reunited with their parents and their sister. Linares said the five of them lived in a roach-infested one-bedroom apartment in Miami, near the old Orange Bowl. They were very poor, living on government cheese, beans, peanut butter and Spam. To help the family survive, the 11-year-old boy knocked on doors, asking people for old newspapers and magazines that he could recycle, earning 50 cents per 100 pounds. And I remember going up to this one house and this old lady came out and she said she didn't have any old newspapers. But she looked at me and she said, "I have something for you." And she came back and handed me this [crucifix]. I went home, took it to my mom. She kept it. My mom was very religious. [His parents died] in 2001. I have it now. [The crucifix is] a reflection of her. It is also a reflection of some kind people in this country. Linares is a retired programmer. He keeps the crucifix in his office, near the computer. My name is Monika Kress, which is an extremely German way of spelling both of those, and I am originally from New York. My parents met when my father, an American soldier, was stationed in Germany during the '60s. Monika Kress was named after a doll her mother took with her when she left East Germany. My mother was born in Dresden. The idea was that she and her parents were going to plan to leave East Germany on foot through the Harz Mountains because the Berlin Wall was in the process of going up. The border was not yet a solid border; it was just patrolled. My grandmother told us that she had a doctor say that the family needed to live up in the mountains and so they got to know some of the local farmers who knew the patrols of the Russians. And so they paid one of the local farmers basically all the money they had to take them across the border. They couldn't bring that much with them, literally just what they could carry in their hands. [My mother] told me that she had this doll stuffed into her bag and the feet of the doll were sticking out of the bag. And as they walked across the border one of the shoes of her doll fell off somewhere along the way. She carried a little suitcase and she had this doll that she had called Monika. She just kind of liked the name. So when they had the second kid and it was another girl, my mom was like, "Oh well, let's name her Monika" because that was the name that she liked, and had some significance to her. And so that's me. 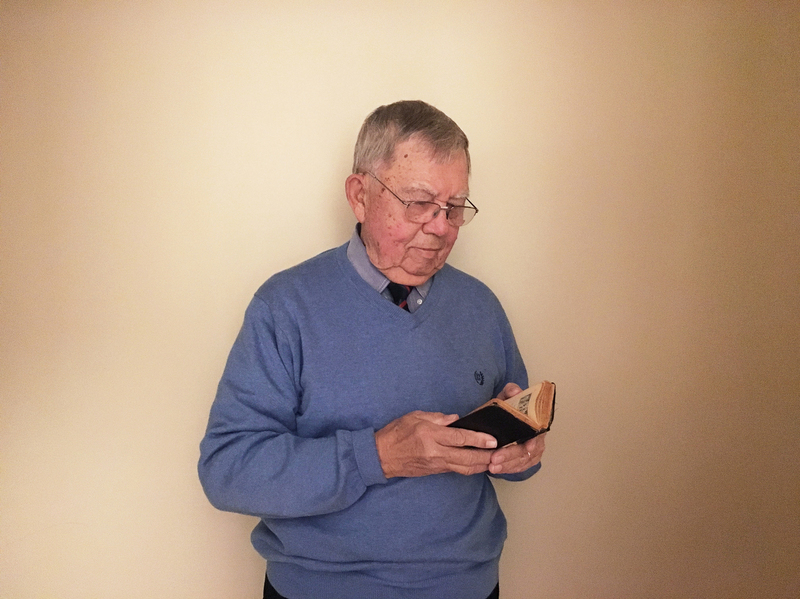 A prayer book, reminder of "my old Papa"
William van Haaren looks at his father's prayer book. My name is William van Haaren. I was born Aug. 1, 1932, in the city of Bandung on the island of Java, which at that time was one of the islands of Dutch East Indies. It's what it was called, in the old days, the Paris of the Orient. My family, with 11 children, was very happy there. It was a beautiful life. Then the good life came to an end after Pearl Harbor. Three months later, we were occupied [by the Japanese], and Dutch citizens were put in concentration camps. [His family was split up.] But, initially, I was in a camp with my two younger brothers, my 13-year-old sister, my mother and my father. A year after we were in the family-style camp, my father was taken away. He was [waiting] to be picked up to go somewhere else, and I was with him. I couldn't stand the pressure. So I made an excuse and ran around the block to the community kitchen to get some food for the family. When I came back, my father was gone, and I always thought, "Why didn't I stay and give him a hug?" I hated myself for not hugging him before he was taken away. In November 1944, a Japanese guard came to the camp [and gave us] a bag with my father's glasses, his prayer book and his fingernails. [Van Haaren's father had died days earlier.] I kept the prayer book with me in my designated sleeping space, which was about a yard and a half on a clay floor. After the end of WWII and the Indonesian revolution, Van Haaren moved to the Netherlands, where he went to medical school. Following his degree, he completed his medical residency in New Bedford, Mass. He now lives in Warwick, R.I. The little prayer book looks a little worn, but it's still in good shape. It's in Dutch. It's 3 inches by 5 inches. I have it now in a special place in my home. I've got this little museum where it belongs. I think I keep it because it's something [his father] held in his hands, in very good times and in bad times. I keep it because it's part of me. It's part of my history. It's part of my life. I'm not a religious person who picks it up and reads all the passages and hopes I get some divine intervention. It's just that it was his book, my old Papa. 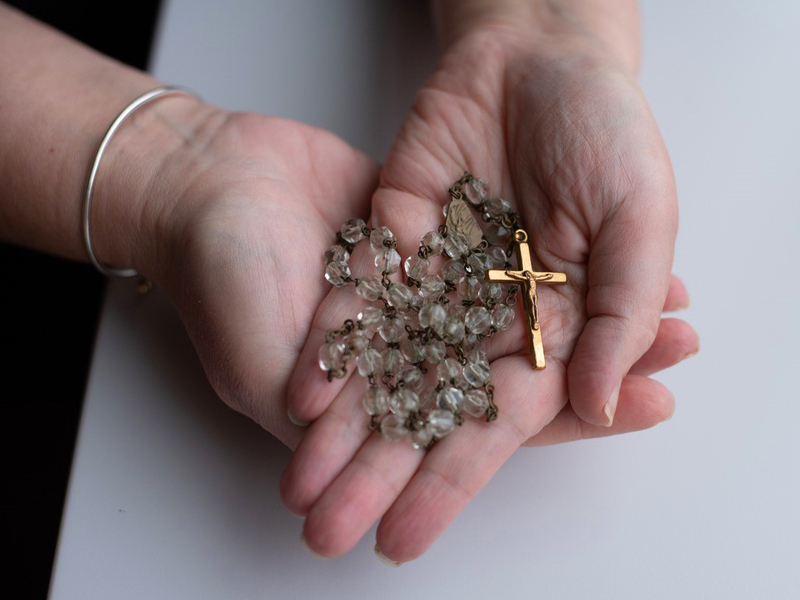 NPR's Isabel Lara retrieved her grandmother's rosary from her apartment after the Sept. 11, 2001, attacks. My name is Isabel Lara. I was born in Boston while my parents were in school, and then they went back to Venezuela. When I left Venezuela, I didn't realize that I wasn't going to go back there. I thought that I was just going off to graduate school and I'd be back in a few years, but the situation of the country just kept getting worse and worse. I really thought that I would live my life in Venezuela. I went to New York for graduate school. I moved into my apartment on William Street on Aug. 27, 2001. I only brought some clothes and some books and I brought my grandmother's rosary because it was meaningful to me and she had it with her all the time and it was small, so I could just have it in my dorm. On Sept. 11, I woke up really early, and I heard a loud noise and then I looked out the window, and there was like all this sort of glass coming from the World Trade Center. That was when the first plane hit. I remember I was watching TV and then New York Mayor Rudy Giuliani said to give blood. That was what you were supposed to do as a New Yorker. So I just grabbed my cellphone and my purse, and I went to try to give blood. I never thought that I wouldn't be able to come back to my apartment. I couldn't go back there for two weeks. Her apartment was just four blocks away from the towers. I kept thinking about the rosary and why I hadn't grabbed it that morning. In my apartment, I had like all these new things I had bought for graduate school like my new laptop, but I kept thinking about the rosary. Lara's grandmother always carried the rosary with her. When I was able to come back, I just walked into my apartment and there was all this ash. When the first tower fell, she closed her window and watched as it turned black from the ash and debris. She left the window closed when she left, but ash still piled into the apartment. Right away, I went to see if the rosary was still there in my travel wallet, and it was. I just felt relief that it had survived. I don't even remember how I got it, but it was something [my grandmother] always had with her. She had that rosary, and she would take it out when she was stressed. It's insignificant. It wouldn't stand out. It's not remarkable-looking. I'm sure it has no value except sentimental value. When I do pray the rosary, which is not frequently, I use that rosary, and I feel connected to her in a way. And I'm just very happy to have that piece of her with me because my life has really not been what I expected it to be, and that kind of links back to my past. I don't know if any immigrant expects to leave, but I was expecting to grow old with my cousins and my family around me. I guess that rosary kind of anchors me. I want to keep it with me. Lara is the senior director for media relations at NPR. My name is Maya Kara. I was born in Budapest, Hungary. We left Hungary after the Hungarian Revolution in 1956. For the last 30 years, I've been living in Saipan. Maya Kara wears gold coin earrings. Her mother took the coins when their family left Hungary after the Hungarian Revolution in 1956. My family's part Jewish, and they sort of survived the Nazi era only to have all our wealth confiscated by the communist regime when it came in. I come from an industrial family. I was basically deemed an enemy of the state and so were my parents, which meant, at that time, that I could have never gone to university. That was one of the big reasons my mother and my stepfather left Hungary, to basically give me a better future. I had an over-the-shoulder small bag and [my mother] basically said I could take anything that fit in the bag. So I chose my favorite historical novel and my teddy bear and that's what fit. My mother basically took her jewelry and wrapped it up in her hair and took gold coins, which were illegal at that time, but it was something that she had sort of squirreled away during the communist era because she knew that some day it may save us. She baked a loaf of bread, which was awful because she couldn't cook [at all], and took out the soft part of the bread and put in the gold coins. That's what my mother and father had. Just a briefcase with their diplomas and the bread with the gold coins. Maya and her family made their way to Austria before leaving Europe for New York. I remember my mother gifting them to me, and I didn't like the way that she had it made into an earring, so I had it redone. And you know I still have them, and I wear them and if people ask me, I tell the story. It's a connection to my past. It's a connection to my family's personal history, and they're also very beautiful. They were minted in the 1700s. I mostly love to wear silver, not gold, but when I do wear gold, I like to wear those. NPR's Uri Berliner, Alec Cowan, Wynne Davis, Phil Harrell, Gerry Holmes, Caroline Kelly, Adelina Lancianese, Michael May and Avie Schneider contributed to this story.